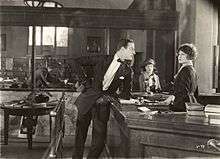 Louis Calhern and Claire Windsor in "The Blot" (Lois Weber Productions, 1921). Louis Calhern, born Carl Henry Vogt, (February 19, 1895 – May 12, 1956) was an American stage and screen actor. For portraying Oliver Wendell Holmes in The Magnificent Yankee (1950), he was nominated for the Academy Award for Best Actor. Calhern's Broadway credits include Roger Bloomer (1923), The Song and Dance Man (1923-1924), Cobra (1924), In a Garden (1925-1926), Hedda Gabler (1926), The Woman Disputed (1926-1927), Up the Line (1926), The Dark (1927), Savages Under the Skin (1927), A Distant Drum (1928), Gypsy (1929), The Love Duel (1929), The Rhapsody (1930), The Tyrant (1930), Give Me Yesterday (1931), Brief Moment (1931-1932), The Inside Story (1932), Birthday (1934-1935), Hell Freezes Over (1935-1936), Robin Landing (1937), Summer Night (1939), The Great Big Doorstep (1942), Jacobowsky and the Colonel (1944-1945), The Magnificent Yankee (1946), The Survivors (1948), The Play's the Thing (1948), King Lear (1950-1951), and The Wooden Dish (1955). Calhern's burgeoning career was interrupted by the war, and he served overseas in the 143rd Field Artillery of the United States Army during World War I.
Calhern started working in silent films for director Lois Weber in the early 1920s; the most notable being The Blot in 1921. A 1921 newspaper article commented, "The new arrival in stardom is Louis Calhern, who, until Miss Weber engaged him to enact the leading male role in What's Worth While?, had been playing leads in the Morosco Stock company of Los Angeles." In 1923 he left the movies, but would return to the screen eight years later after the advent of sound pictures. He was primarily cast as a character actor in films while he continued to play leading roles on the stage. He reached his peak in the 1950s as a Metro-Goldwyn-Mayer contract player. Among his most memorable screen roles were Ambassador Trentino in the Marx Brothers classic Duck Soup (1933) and three that he appeared in at MGM in 1950: a singing one as Buffalo Bill in the film version of Annie Get Your Gun, the double-crossing lawyer and sugar-daddy to Marilyn Monroe in John Huston's The Asphalt Jungle, and his Oscar-nominated role as Oliver Wendell Holmes in The Magnificent Yankee (re-creating his stage role). He was also praised for his portrayal of the title role in Joseph L. Mankiewicz's film Julius Caesar in 1953 (adapted from Shakespeare's play). He also played the grandfather in The Red Pony (1949), adapted from the novel by John Steinbeck and starring Robert Mitchum, and the spy boss of Cary Grant in the Alfred Hitchcock suspense classic Notorious (1946). A performance as Uncle Willie in High Society (1956), a musical remake of The Philadelphia Story, turned out to be his final film. Calhern was married four times. First, to Ilka Chase from 1926 to 1927, then to Julia Hoyt from 1927 to 1932, and then to Natalie Schafer from 1933 to 1942, and Marianne Stewart from 1946 to 1955. All four marriages ended in divorce. Calhern died of a sudden heart attack in Nara, Japan, while filming The Teahouse of the August Moon. He was replaced in the film by Paul Ford, who had played Calhern's role in the original stage version. By an odd coincidence, when playing Buffalo Bill in Annie Get Your Gun, Calhern had replaced Frank Morgan, who had died of a sudden heart attack during the making of that film. Calhern is interred at Hollywood Forever Cemetery. The Magnificent Yankee (1946) as Justice Oliver Wendell Holmes, Jr.
↑ Obituary Variety, May 16, 1956. ↑ Dennis, Ken (Summer 2011). "Louis Clhern: Distinguished Gentleman". Films of the Golden Age (65): 58–68. 1 2 "Greetings". Mexico Evening Ledger. Mexico, Missouri. February 18, 1952. p. 6. Retrieved February 13, 2016 – via Newspapers.com. ↑ "Louis Calhern". Playbill Vault. Retrieved 13 February 2016. ↑ "Actor Favors Showing German War Pictures". The Gazette Times. Pittsburgh, Pennsylvania. June 12, 1921. p. 44. Retrieved February 13, 2016 – via Newspapers.com. ↑ "Star Studies". Oregon, Portland. The Oregon Daily Journal. January 16, 1921. p. 44. Retrieved February 13, 2016 – via Newspapers.com.